Well, after years of listening to all the outrageous comments on the Minelab Explorer , one of the minelab metal detectors, I bought one. Mainly to disprove the silly claims and settle the issue. Well the day arrived when it showed up and I opened the box and it took it a bit longer for me to put together than other detectors. I like the cord which is not wrapped around the shaft. It looks cleaner and keeps the cord tight. I got the Explorer. After going over it to make sure I got it ready for turning on I took it out back. When I pushed the power button it took a few seconds to adjust and stabilize. When I moved the coil over some test coins in the back yard I did not believe that I should ever be able to use this machine. In fact I was sure of it. The sounds sounded like an orchestra tuning up as the notes ran up and downscale indicating something but I didn’t know what. They seemed three foot wide over the coin. How it could ever find a coin seemed impossible to me. I went inside and tried to relax. In a few minutes I stirred up my courage again and I took it back outside. This time I could see that it was quite sensitive. So sensitive in fact, that you could hold the coil off the ground some distance and still read the coin. I listen to the flute sounds until I gave up and went inside to relax again. It was never going to work! After a few more minutes and I steadied my nerves and I took it outside again. This time I worked with pinpoint until I got the hang of it. Now it made some sense and I could see that it might be used as a detector. I pushed up the sensitivity all the way and selected deep search on the menu. I moved that big old coil over my 8 inch dime buried in the yard. I got a good reading and it indicated dime. Nearly all machines will locate the coin but cannot tell the ID. Then I lifted the coil. I could hold the coil at six inches over the ground and locate the 8 inch dime and read the ID as a dime! OK, I was convinced, metal detectors had just jumped a quantum leap and now all those worked out relic grounds and old city parks are wide open again. 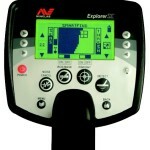 Minelab’s Explorer has bugs for sure and the construction deteriorates quickly but it will blow the doors off the barn! Hunting with other, lesser detectors will just not get you close to what the Explorer will do for depth and ID. Basically I believe it will be close to twice as deep with ID than many, many other detectors. If you are hunting an old park or relic ground you can be in business again! This machine has all the pro control that you might want and more. Adjustments on iron and select/reject notches too. I can’t think offhand of anything they might have forgotten except wheels and a BIG shovel. It appears that I will have to bury a test garden at twice the depth as before to fully size the capability of this machine. I am given to understand that it will just ignore rusty nails and trash even seeing through iron targets to find the goodies. I like the fact that it comes with a rechargeable battery pack and A/C charger. The battery pack can even be charged in your car! Charge time however, is slow and takes 16 hours. There is a battery pack for AA batteries that you can carry for a backup. One Explorer hunter found a 1912D penny 12 inches deep. The depth gauge was totally clear. In my back yard is a underground PVC water line and wire which is buried from 2 to 3 feet deep. I walked across the old line which has been buried for 10 years and the threshold nulled quite noticeably. I moved on down the line and it did it again right over the old line. On my Fisher detectors sometimes I noticed that far out of range good targets would null the threshold like that. As long as there has been metal detectors hunters craved for a detector that would reach down that deep, now we now have one. It is pretty strange however, and instead of a beep when you pass the coil over the coin, you get a high frequency tinkling with a fallingsound. It takes a while to learn what to look for!. There are two modes of hunting. One with a digital number readout and the other with a crosshair box in a discrimination field overlaying the programmed discrimination pattern that you are using. Almost any capability you would desire has been built into this machine. All of course, but a single BEEP! I should mention, there is another way to hunt old coins. Instead of watching the Digital ID number or the crosshair display you can watch the depth guage. When you get a signal that indicates extreme depth it is most probably a very good old coin. I can see though, if you have back problems, this machine might bother you. It is quite heavy and hunting with it could tire you pretty quickly. As I gather more information I will add programs and info to this article. You will not read any wild claims here that do not have a basis in fact. The Minelab Explorer is quite an outstanding detector.